Do you come across difficult people with whom you would like to be able to work better? 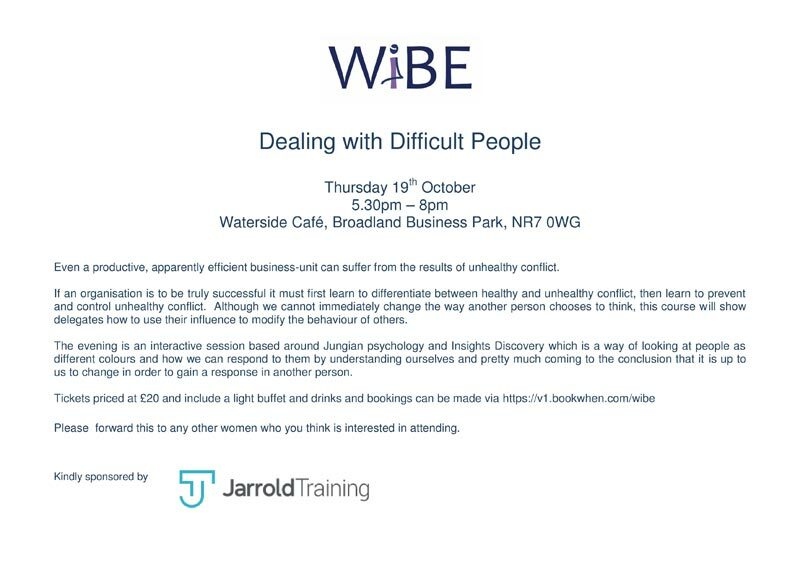 WiBE’s next event promises to help you in those situations and is titled ‘Dealing with Difficult People’. The evening is an interactive session based around Jungian psychology and Insights Discovery which is a way of looking at people as different colours and how we respond to them by understanding ourselves and pretty much coming to the conclusion that it is up to us to change in order to gain a response in another person. Kindly sponsored by Jarrold Training, the event will be held on Thursday 19th October at the Waterside Cafe at Broadland Business Park from 5.30pm – 8pm. More details are available on the flyer below and bookings can be made via the WiBE’s booking page on bookwhen.com.